Winning Edge Designs has changed the way the golf bags look on tour. From Sergio’s bull to Ian Poulter’s face, the tour bags have never looked so different thanks to these designs. Whether you’re a scratch golfer, or just hitting the links for the first time, WINNING EDGE Designs has created an exciting selection of products sure to bring a bit of levity and humor to a game that’s often riddled with frustration! 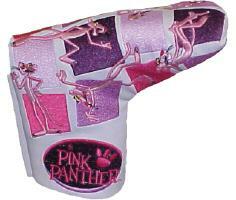 As most of the readers of this site know, I use a Winning Edge Design headcover and enjoy it very much. When we first got the request to review these THP was quite delighted with the thought of finding out some history behind this very unique brand. We had the pleasure of speaking with Stan Denenberg of Winning Edge about the history and how the products came to be. THP – Can you tell us how you first got started in the headcover business? Stan – I was a longtime golfer and I was working in the gift business. I was working for a company that made collectible stuffed animals. I was on the course one day and saw some animal headcovers that were very crude designs. A light bulb just went off at the time. THP – When did you start? Stan – The thought was in 1998 and we debuted at the PGA show in 1999. THP – What did you start out with as far as characters are concerned? Stan – We debuted with 24 styles. When we first started we decided to get some licensed characters that would have age crossover appeal. Characters like Popeye and Betty Boop were the first ones that we went with. And in 1999 cigars were all the rage, every corner had a new cigar shop, so we had 6 different dogs smoking cigars. All in all we had 24 styles when we made our first appearance. THP – How were you received? Stan – We were almost overwhelmed. So many people really loved the idea behind them and the business took off. THP – So many tour players seem to have your unique designs, how did that come to be? Stan – We were at a show in 2001 and a gentleman came over to me and said he was working with John Daly and wanted to have a headcover designed for him. The gentleman was in charge of John Daly Enterprises and told us a story of how Chi Chi Rodriguez had given John the nickname “The Lion”. 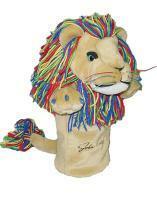 We designed the Lion for him with the multicolored hair and the rest was history. THP – Did that explode fast? Stan – Two months after John Daly had his headcover done, Fuzzy Zoeller was playing with him and asked where he got it done. Then we spoke to Fuzzy and he wanted a Duck. From there tons of players got in on it from Sergio with his Bull to of course the Benji Hogan Dog that is one of our favorites. We have about 3 dozen Tour Players using them now. THP – How do you come up with the designs for the players? Stan – We usually have the players come up with their own idea. It makes it much easier when they know kind of what they want, and then we put it together for them. If they want us to come up with something for them, it can be tough. THP – What is the oddest request you have had? Stan – Good question. 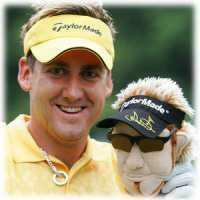 The craziest one was Ian Poulter. We were speaking to him on his mobile phone and we asked “what would you like to have done?” His response was “I want the headcover to be me…My head”. It worked like a charm. We have since done a Gary McCord head as well. THP – Tell us what is coming up from Winning Edge? Stan – We have a lot more to offer than the original 24 that we started with. Like I mentioned we have three dozen tour players as well as quite a few licensed characters. We will keep putting out more and more stuff. Thanks. The Tour-tested headcovers are as functional as they are fun. Each headcover features a special anchoring system that insures a secure fit on all size clubs-including today’s oversized and geometric shape drivers (460cc.). Each also has a soft, quality, sherpa-like lining, specifically tailored to protect clubs and putters from damage. All items are made using only the finest custom-milled fabrics, in exciting, colors and materials. Many of the minute details are the result of careful hand craftsmanship, lending each item a unique flair and distinctive personal touch. Finally, WINNING EDGE cover attachments — characters’ eyes, noses, accessories — are securely fastened to withstand golf cart motion and inclement weather, not to mention those infuriating missed putts. These are Tour-tested headcovers, made to last. As many of the readers know, I have been using the Ian Poulter head cover for quite some time now and love it. It is a great conversational piece and takes good care of my clubs. Everybody should check these out. For a few dollars you get a great piece that adds some fun to every round. You can read all about them and where they can be found for purchase at Winning Edge. These are cool! I’m going to order one or maybe a few actually. MY ?’s are: Are they large enough for the big 460 heads? And, would one be too big for a modern day 3w? They do fit standard size drivers. And they will certainly fit 3 woods as well. I really want that Benji Hogan one. That was a great story. I have the Pat Perez boxing glove and I love it.